A Sourcerers sculpture was one of many figures found in a Google Expedition. Parkside School in conjunction with Prairie Rose School Division instructional coaches have enabled the opportunity for an enhanced visual learning class for students which started last year. Students are taught to log in and explore Google Expedition on their smartphones using Augmented Reality (AR) which is a live direct or indirect view of a physical real world environment whose elements are supplemented by a computer-based sensory input. “AR is different than VR (Virtual Reality). 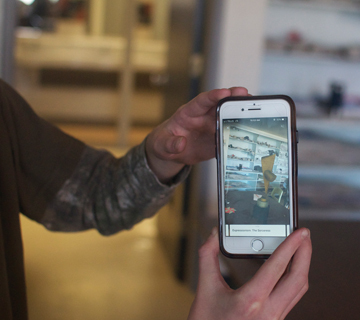 AR is just an artifact in its presence,” said school art teacher Kameko Hillock-Ballantyne. Her process is to go into the Google program, choose topics for the students to discover and research such as science where expeditions will appear including Planet Earth to interactions with the eco system for the students to explore. The program’s curriculum is helping to reduce the negative impact on technology. “We’re trying to get away from the stigma of technology being bad for students and making it more of a positive thing for them to explore into worlds they might not have ever been in to” she said. Grades 7, 8 and 9 students take the class twice a week and ‘”it’s a way for them to have an opportunity to see how art can help their creativity,” she said. PRSD instructional coach Cathy Hynes has been working with the program since its inception. “I think for a lot of our students in Prairie Rose our ability to get out and see the world-that global perspective-isn’t there for everybody,” said Hynes.